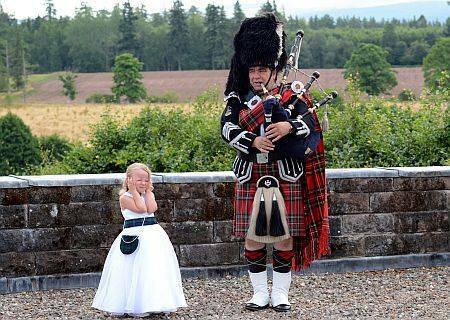 So you’ve hired a piper for your wedding or event but you’re worried that you’re not going to know any of the music. You don’t mind a few classics but you’d like a few numbers with a bit more of a modern spin on them, worry not! Help is at hand as we offer an exhaustive exploration of modern(ish) chart hits covered on the bagpipes. This guy wins points for performing this right next to the Clyde in the centre of Glasgow, we like a hometown boy. Big fans of the original and this cover is well worth a listen if you get the chance! Ok this one’s a bit of a cheat, being that the song is coming up to it’s 25th anniversary (way to make us feel old passage of time!) but this is pretty cool. The band are called Dudeldrum, they’re from Russia and their musical genre is described as Bagpipe Folk by Youtube, not the kind of band you come across everyday! Whilst he may not cover Metallica or Taylor Swift he adds a touch of class whatever the occasion.